← Oxygen – provider of life. I aim to demonstrate in this series of posts that ever changing gravitational tides influence the flow of the polar Jet Stream thereby changing weather patterns at high latitudes. Such effects should be included in global circulation models to improve medium range weather forecasting. Previously I described a proposal from Roberto Madrigali that tides acting on the Jet Stream affect high latitude weather (North and South). Robert Currie and others have reported long term coincidences of drought with Lunar Cycles (1). H. Yndestad reports lunar cycles in Arctic climates (2) and Li & Zong have reported lunar induced variations in global wind speed (3). Over 3000 years of folklore also links the moon to extreme weather on earth. Is all this just nonsense, or could atmospheric tides really be responsible for much of our weather in Europe and North America? I decided to look into this in more detail and have spent the last few days calculating the horizontal tidal forces acting on the earth. To do this I used the JPL ephemeris to calculate the net tidal vector of the moon and the sun acting on the earth, and used the formulae derived previously to determine the horizontal tractional force for a given angular separation from the central net vector. In a north south direction this angular separation is the same as latitude. It is these tractional forces that cause the ocean currents that generate the two familiar tidal bulges. Although the forces are about 10 million times smaller than gravity they act perpendicular to gravity and cover vast regions of the earth. They also generate measurable winds in the upper atmosphere especially near the poles. The largest tractional forces occur at the extremes of latitude and can vary dramatically from month to month and year to year as the relative positions of the earth moon and sun change. The rotation of the earth then causes the familiar ~twice daily high tides. Their effect on the atmosphere is yet more complex also generating a small torque through the Coriolis effect. The hypothesis presented here is that maximum tides induce meanders in the Jet Stream and mixing of warm and cold air masses which then trigger storm systems. I estimate that the horizontal force acting on a 1000km long stretch of the Jet Stream to be roughly half a billion newtons or the equivalent of 10,000 metric tonnes weight. My calculations for the year 2013/14 are shown below. The animation shows a calculation of the horizontal tidal forces acting on the oceans and atmosphere as the moon and earth orbit both each other and the sun from 1 Oct 2013 until 30 September 2014. The daily variations are shown for a fixed longitude -30 deg. and show the maximum of either the lunar facing or the opposite tide. That is why the central bulge stays above the equator. Note that a series of severe storms hit the UK on Dec 5-6, Dec 23-24, Dec 26-27, Dec 30-31,Jan 3-6, Feb 4-5, Feb 12-14. This winter was a period of especially strong tides and this summer will see 3 super moons. The animation shows that the strongest tidal forces must affect the polar Jet Stream zone. Rapid changes in these tidal forces generate differential torques acting on the Jet Stream as the earth rotates by coriolis effects. Did these torques then trigger the destructive UK storms this winter ? 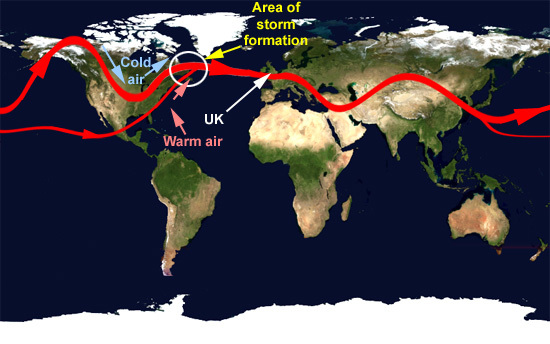 Meanders in the Jet Stream caused the extreme cold weather across North east America and also placed the UK directly in the firing line for Atlantic storms. Warm air sucked up from the Gulf created unstable conditions for storms to develop. The trigger for these storms seems likely to be rapid variations in atmospheric tides at the critical latitude. Judge for yourself. Now we look more into the effects of the 18.6 year cycle, which is reported as being responsible for changes in rainfall across China and North America. In the following animation I just follow the lunar facing tide to show how strongly asymmetric the tides can get. June 2006 saw a major lunar standstill. This is when the moon’s orbit reached its maximum declination of 28.5 deg. The tidal bulge moves from a latitude of -28.5 deg to + 28.5 deg in about 14 days. This animation shows the tractional tidal force field centered on a longitude of -30 deg. Only the lunar facing tide is shown. In reality there are 2 high tides every day as the earth rotates through the lunar facing tide and its mirror on the earth’s opposite side. Do such large changes in tidal forces tweak the Jet Stream mixing polar air with warm air thereby affecting weather systems ? Ensemble model based forecasts are accurate over short terms. Would these be improved if tidal forces on the atmosphere were included? The evidence is that the answer is quite probably yes. Shown below is the 2 week prediction for London weather from today (August 4) by the Global Forecast System Ensemble of models prepared by Roberto Madrigali. A period of instability is expected exactly coincident with the largest “super-moon” tide this summer. Lets see what happens over the next 2 weeks. GFS Ensemble predictions for London for 4 August ( the day I wrote this post). Top curves are temperature, bottom curves are precipitation. The maximum tidal forces are shown in the centre. 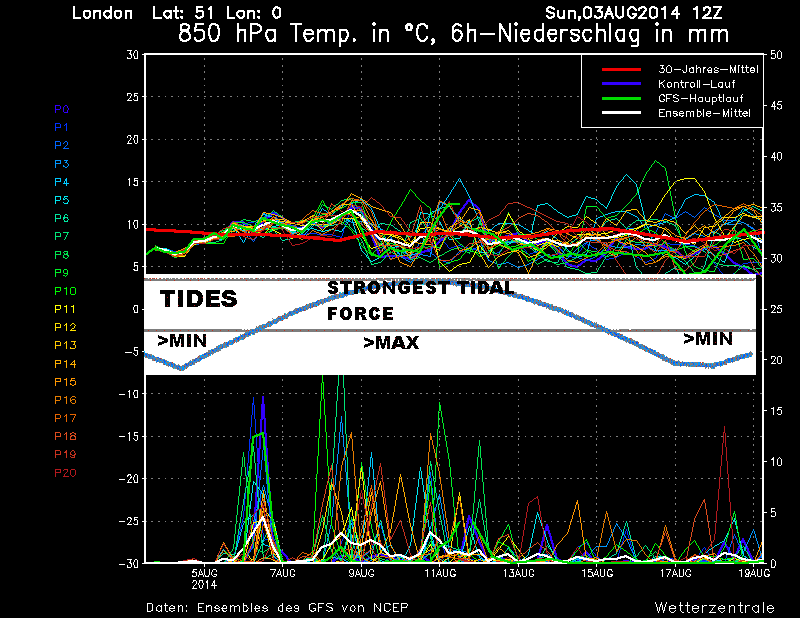 The period of instability is synchronous with the extreme tidal maximum August 10th the 3rd super-moon of 2014 ! We often hear the analogy that because our weather is chaotic, storms can be generated just by the flapping of butterfly’s wings. Well there is a prime candidate for that butterfly effect – the ever changing tides acting on the northern and southern Jet Streams! Perhaps its time now to take the moon more seriously ! 2) H. Yndestad, The influence of the lunar nodal cycle on Arctic climate, ICES Journal of Marine Science, Vol 63,3 P 401-420. This entry was posted in climate science, Meteorology, Physics, Science and tagged Jet Stream, Moon, Storms, Tides. Bookmark the permalink. Clive, thanks for the heads-up. This looks very interesting, and I’ll check back in when I get back from my backpacking trip. I know Bob Weber will be interested. Looking forward to the discussion at the Talkshop. How does the moon relate to the wavy Jetstream of the maunder minimum or other cold regimes? What gave you that idea Craig? Very interesting Clive. The animations could be made more realistic by rotating the earth. max northern declination angle of 18 degrees and 45 minutes. July 22, the moon had just about reached max dec angle north, and it brought a heat wave with its northward-going atmospheric tide that reached straight north from Texas nearly all the way to Canada. Shortly thereafter, as the moon “went the other way”, headed south this time, cold fronts started dropping out of Canada, and by the time first quarter moon had arrived, the US was covered by cooler temps following a cold front that draped itself all the way south to the Gulf of Mexico, presently pushing “Bertha” away from the US eastern coast. If it weren’t for the fact that solar activity had just picked up from the floor level it was at during the previous weeks, as SSN and F10.7cm flux both went up recently, it’d be much colder now in the US. As it stands, there has been next to no “heat index” readings in the morning anywhere in the US for almost a week, as opposed to weeks before when readings in the 80’s and 90’s were prevalent. We’ve had nice summer warmth here in Michigan during this current solar blast, compared to chilly 50s and 60s during the solar “all-quiet”. In three days, on the Aug 8, the moon will be headed north again until the 20th, and it will bring warm humid tropical air with it, no matter what the sun is doing. The sun’s expected variation can be found here at http://origin-www.swpc.noaa.gov/products/usaf-45-day-ap-and-f107cm-flux-forecast , and they are saying the solar flux will drop off from today’s level of 156 down to about 105 on Aug 20. In other words, the moon’s influence through tidal action on northern hemisphere atmospheric temperatures will this month exactly counteract the sun’s currently less active less radiant output period. The fact that’s it a “super” moon this month will most assuredly intensify those tidal effects. There is certainly much more to learn about the moon. I agree there is much more to learn about the moon. What about the opposite side tide ? With the moon at southern extreme declination the mirror tide opposite is at northern extreme latitude. I think there may be a torque effect when the moon is changing declination and the earth rotates. The maximum tides are expected at August 10 which coincides with another super-moon. Very little because the moon is still comparatively very large. Just before morning, on the moon gets so cold, can liquefy nitrogen there. I f there was rocks made of gold, wouldn’t be economical, to mine it. Richard Holle has done quite a bit on the atmospheric tides idea. I think the oceanic affects are probably more important to climate as opposed to weather. Scaffeta has pulbished several papers that find a 9.1 y cycle in various observations and an ingenious way to show from JPL ephemeris data that this is lunar in origin. I have suggested that this is probably the mean frequency of 18.6/2 and 8.85 ( lunar apsides ) The is 9.05 from memory that fits with 9.1 to within the claimed accuracy of that figure. Curry/BEST also reported a similar periodicity in land surface temps. We see the monthly cycles in these animations but what is more interesting is the long lunar cycles. The eclipse cycle is halved since there is a similar configuration with the moon in opposition to the sun as well as the eclipse alignments, ie twice as often. I did a spectral analysis on trade wind data that showed a triplet of frequency peaks that would correspond to amplitude modulation of 4.43 years. That splitting produces peaks at around 3 years and 5 years. This is the classic description of “3-5 year” pseudo periodicity of ENSO. 4.43y is half the precession of the lunar apsides: how the point of closest approach moves around. difference between perigee and apogee is about 14%, The tidal force of thus changes by almost 50% from max to min !! Since point of closest approach passes over the equator twice per cycle ( similar to the sun passing the equator twice per year ) this will be the timing of any horizontal tidal effects on the tropics. Taking this one step further, I have also suggested that the true origin of El Nino is a tidal effect on the thermocline. This is density boundary similar to the density change at the surface but about 1000 time smaller. That means it will resonate to tidal forcing about 1000 times slower. A crude, back of envelop calculation 1000x12h = 1.4 years. The right order of magnitude to be the root cause of ENSO. A closer look at the density change is needed. Orthodoxy says ENSO “creates itself”. I find that unconvincing. To clarify the apsides effect, consider the last animation, where we see the blob moving up and down across the equator. Sometimes it goes higher and lower, this is because lunar declination is solar declination +/-5.5 degrees. so is not fixed. Then the depth of the blue and red oscillation varies depending upon the timeing of the closest approach in relations to the lunar declination angle. It is the these combined cycles that give rise to things like 4.43, 8.85y and 18.6y etc. I am India right now with bad connection so apologies for the short reply. Thanks Clive. If you intended a link to something it seems to have got chpped by WP. If we look at the easterly horizon on those animations we can see a wave in the vetors running up and down. This is the “monthly” variation of declination angle. There are three lunar periods : 27.232, 27.5345 and 29.5 days (from memory). The last one is the visible waxing and waning. It is the interaction of all these close periods that give the longer annual cycles. It needs to be remembered that although we measure tides vertically they are essentially a horizontal displacement of water. Variations in the magnitude in declination angle ( latitude ) determine how high and low that ripple goes. Apsides determines how strong it is and where the moon is when it is closest. This all implies large scale importation and exportation of surface waters simultaneously north and south in and out of the tropics. ie massive heat transfers. I suggested this was significant a couple of years on WUWT and someone some knowledge of tidal models poo-pooed the idea. He then went away and did some calculations on a simple tidal model and ended up agreeing that the was sufficient volume of water displaced to have a small effect on climate. In view of the Bjerkness effect and positive feedbacks from the trade winds, I think this will get amplified into a significant factor. This then all gets linked into the atmospheric aspect you posted about.